Jerome Rothenberg received his BA in English from the City College of New York and his MA in English Language and Literature from the University of Michigan. A member of both the Visual Arts and Literature faculties, he has served as Chair of the Visual Arts Department and as director of the Literature Department's creative writing program. Jerome Rothenberg is an internationally renowned poet, performance artist, critic and scholar, whose work reverberates well beyond the conventional and somewhat arbitary categories that have often proved useful to define academic disciplines. He has published over eighty books, booklets and pamphlets of poetry, several of which have been translated into French, Spanish, Dutch, Finnish, Flemish, German, Polish, Swedish and Portugese. 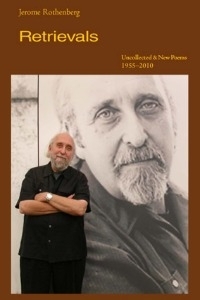 In addition, he has assembled, edited, and annotated ten enormously germinal anthologies of experimental and traditional poetry and performance, beginning with Technicians of the Sacred in 1968, and has been a leading voice in the approach to creative work and mind that he named "ethnopoetics." He has also acted as editor and co-editor of several notably influential magazines including Some/Thing, Alcheringa, and New Wilderness Letter, and has appeared as a performance poet and artist at many of the most distinguished venues in North and South America and Europe. Rothenberg's poetic work, Poland/1931, has been staged by the Living Theater in New York, and several of his soundplays have been produced by Westdeutscher Rundfunk in Germany. His recent works include a translation of "poems performance pieces proses plays poetics" by Kurt Schwitters (for which he won a PEN Center USA West award for translation), Poems for the Millennium, a two-volume global anthology of the twentieth-century avant-garde, A Book of the Book, a gathering of artworks and essays on the poetics and ethnopoetics of the book and writing, Writing Through, his selected translations and related writings (winner of a PEN American Center award for poetry in translation), and a first-time translation of Picasso’s collected poetry, The Burial of the Count of Orgaz, & Other Poems. Both Poems for the Millennium and The Lorca Variations won PEN-Oakland Josephine Miles Awards for poetry, and his latest book from New Directions, Triptych, was published in 2007. Publications for 2009 include Poetics & Polemics, a selection of his essays and interviews from 1985 to 2005, and a third volume of Poems for the Millennium, an attempt to bring nineteenth-century Romantic and Postromantic poetry into the present. His two most recent books of poetry, both published in 2010, are Gematria Complete and Concealments & Caprichos.